The Boston Massacre | What Would The Founders Think? Alok Tripathy Heritage Hospitals generic for actonel 150 mg Lanka Varanasi Uttar Pradesh The Antiseptic..
Paul Revere, immortalized for his “midnight ride” was also a craftsman who wasted no time in producing a colorized engraving of his version of the event. The Boston Massacre Historical Society has some interesting details on Revere’s famous print. In addition to the event’s significance in fostering revolutionary spirit in American, it also provided a unique opportunity for a young John Adams to show his quality. In a move that can only be described as gutsy, Adams agreed to defend the British soldiers and civilians indicted by a grand jury for having fired upon the mob. Captain Preston and his men could have faced the death penalty if convicted. But they couldn’t find anyone to represent them. Enter John Adams. Adams was masterful in his defense of the accused. Well aware of the sympathies of the jury, he was careful to shift the focus of the blame to London off the accused. 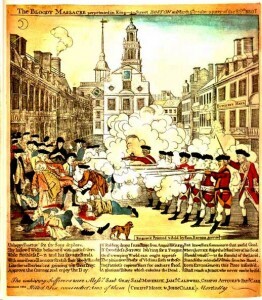 Thus, the Boston Massacre was not only a signal event that led to the Revolutionary War and the Royal Governor’s evacuation of troops from Boston, but also launched the career of John Adams. Adams would go on to serve with distinction in Continental Congress and as the nation’s second president. I like this article very much. 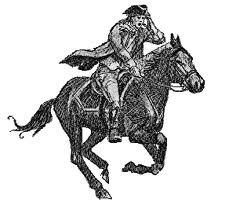 Few remember that Paul Revere was a silversmith, and I had forgotten the trial. Thanks! Thanks Ann, I’m glad you enjoyed it.